Solar Bonds Pay Up to 5.75%. What's the Risk? On Facebook I saw an ad promoting a Solar Bond that paid up to 5.75%. Intrigued, I clicked over to learn the details. The good news is that the bonds are offered by Solar City, a legitimate, publicly traded company that is a leader in installing solar panels on houses and businesses. The company chairman is publicly traded on the Nasdaq at SCTY. Its chairman is Elon Musk of Tesla and SpaceX fame. On Facebook I saw an ad promoting a Solar Bond that paid up to 5.75%. Intrigued, I clicked over to learn the details. The good news is that the bonds are offered by Solar City, a legitimate, publicly traded company that is a leader in installing solar panels on houses and businesses. The company is publicly traded on the Nasdaq at SCTY. Its chairman is Elon Musk of Tesla and SpaceX fame. Mr. Musk is a bold visionary who exceeds at extracting an enormous amount of capital from investors with Herculean bets on the future. His track record at generating profits at the companies he is associated with is less impressive as neither Tesla or SpaceX are profitable at their core businesses - yet. Their general model is for the company to pay for the cost of the installation and then lease the equipment back to the homeowner over a twenty-thirty year period. The savings that the homeowner generates on their electricity bill pays for the lease and often leaves some left over, providing an electricity credit to the homeowner. Government subsidies of up to 30% of the installation cost also help to make the installation more affordable for Solar City and the homeowner. These rates are for bonds purchased directly from the company via an online ordering system. I haven't tried the system so can't vouch for how hard or easy it might be to register and order. Investors can also purchase them through a broker but the rates are slightly lower. These bonds are not FDIC insured and if the company goes bankrupt, bondholders could lose interest or even principal. Interest is typically paid semi-annually (twice per year) although it may vary according to bond type. Should You Invest in Solar Bonds? As of April 15, 2015, the best risk-free rate on an FDIC insured CD according to BestCashCow is close to 2.30% APY. The rate on a five year Treasury Security is 1.31%. The five year muni bond average is a bit worse according to Bloomberg at 1.26%. The ten year yields show a similar spread. Solar City's offering is akin to a high yield bond, otherwise known as a junk bond. Now, the name doesn't mean the bond is junk, but it is risky. An examination of the company's income statement and balance sheet will illustrate the risk. Solar City's 2014 annual report shows that the company had a net loss of $375 million versus a net loss of $96 million in 2013. Why the loss? The company had an operating profit of $79 million with a 30% operating margin. It's not a great margin but at least they generated an operating profit. Their operating expenses, especially Sales and Marketing were responsible for the widening loss. One way to look at this is that Solar City is in expansion mode and is paying heavily now to get as many panels on customer homes as it can. Once it does this, it will have a recurring revenue stream for the next 30 years, as consumers are not going to rip up the panels. Sounds good. The only problem is that 30 years is a long time. New technology may arrive and make these panels obsolete. Or the utilities may change the way they buy back excess electricity from the homeowner. As a bondholder, you will have to be confident that no matter what the changes, the company will have enough cash over the time period of the bond to pay you interest and also principal. The balance sheet shows the company has about $700 billion available in cash or cash equivalents to pay the bills. Looking at cash flow, the company used up $1.3 billion in cash last year, the biggest amount being used for payments for solar energy systems that will be leased. The company is a bet on whether it can successfully deploy and lease these solar energy systems in a way that generates enough positive cash flowing going forward. Solar City is a promising company, but it is also a risky one with no history of profits. It could succeed spectacularly or it could also just as spectacularly crash and burn. Whether you invest and how much you invest depends on your risk tolerance. If you are willing to stomach the potential of losing your investment and want the higher yield, then this might be an investment for you. The shorter term bonds obviously offer less risk. If you want to be as assured as possible (is there really ever any assurance in life?) that you will receive your interest payments and principal back then this is probably not an investment for you. By and large, I think Suze Orman is great. She provides a great service in telling people with little in way of assets how to preserve them. But, I watched her recent presentation on PBS as part of their fundraising effort, and she was giving one piece of advice that is just dead wrong in the current rate environment. On Suze Orman’s PBS special, she was telling her audience (the US middle and lower classes) that they should be buying 5 year municipal bonds with any money that they have available and want to safely park for the next five years. While this advice is ordinarily very good counsel for those in the highest Federal and State tax brackets (not Suze Orman’s audience), it makes little sense at all in the current rate structure. And, it absolutely makes no sense for Suze’s target audience. Here is why: A AAA-rated insured NY municipal bond which matures in 5 years is going to trade at 1.20% at the moment, if you have a broker who can find you one. The fully taxable equivalent for someone who lives in NY City and pays 39% tax (Federal, State and NY City) is about 1.96%. For someone who is in a lower tax bracket, the fully taxable equivalent will be lower. An AAA-rated municipal bond in other high state-tax States like Illinois, California, Massachusetts, Georgia or New Jersey is going to trade roughly at the same level. In States with low taxes, or no taxes, like Florida or Washington, you may be able to find a high quality 5 year municipal bond trading close to 1.50%, but in no case at the moment is a holder going to a fully taxable equivalent more than 2% on a safe municipal bond. On the other hand, a fully FDIC-insured 5 year Jumbo CD issued by CIT bank currently pays 2.27% APY, and several online banks are offering 5 year CDs with rates as high as 2.25% APY. Those rates are available nationally, but depending on where you live, you may find higher rates on BestCashCow that are offered in a branch by a local banks and credit union near you. Unlike a municipal bond, the purchase of a CD – online or otherwise – ordinarily involves absolutely nothing in the way of a transaction fee (hidden or otherwise). More importantly, while an investor may think that they do not need access to their money for five years, it is very possible that life circumstances can change and they could need to access it. In the current interest rate environment, an investor could lose significant principal on a new municipal bond purchased today if rates rise (which is something Suze Orman realizes and her reason for cautioning against bond funds at the moment). With a CD, that investor would only face an early withdrawal penalty, expressed in terms of interest although it may affect principal in the event of an extremely early withdrawal. The CIT Bank and Synchrony Bank penalties for earlier withdrawal on a 5 year CD, for example, are only 12 months and 6 months, respectively. Suze Orman’s advice is generally very good. But, in recommending municipal bonds, she is wrong because she is not aware of the current bond and CD rates. You can always remain up on the rates by checking them here. TD Ameritrade is currently syndicating a 6 year callable step-up CD issued by JP Morgan Chase. The CD represents perhaps the most transparent "heads I win, tails you lose" offering available, and should be avoided. The JP Morgan Chase CD being syndicated by TD Ameritrade has a maximum maturity of 6 years, paying 1% for the first two years, 2% for the next year, 3% in years 4 and 5, and 5% in year 6. The note - however attractive it may appear at first glance - is callable anytime after 6 months and therefore should be absolutely avoided. More likely than not, if interest rates remain low, JP Morgan Chase is going to call the note within the first two years. If interest rates, however, were to begin to revert to historically normal levels over the next two years, JP Morgan can continue to pay note holders rates which may very well be below market rates at that time into years 3 through 5, calling the CD at any point should it be offer a rate than begins to become close to a normal rate of return. Since JP Morgan Chase has the call option, the entire proposition is in their favor, and while I have often advocated that investors look at structured notes that involve their effective sale of a call option, those notes always involve the receipt of higher interest rates in the near term in return for the sale of the call (often as high as 10 or 11%). In this case, JP Morgan is giving depositors a 1% interest rate for the first two years - a rate which is even worse than the best cash rates today! See and compare the best cash rates here. To boot, these types of syndicated structured notes are not liquid, and cannot even be redeemed early by paying an interest penalty the way that ordinary CDs can. Rather, purchasers of these notes who want out early will essentially be relying on TD Ameritrade (or a subsequent broker) to go out and get the market price (i.e., take whatever anyone is willing to pay for the CD). Even a depositor who wants to bet that rates are not going to rise over the next 5 years and is willing to lock into a rate for that time would be better off buying a 5 year CD. The current best rate on a 5 year CD is 2.32%. Exclusive of tax consequences, $100,000 invested in that CD will produce $12,150 over the next five years versus the JP Morgan Chase product which will produce $10,386 if not called earlier. The 5 year bank CD, unlike the JP Morgan product, can be redeemed early by payment of an interest penalty fee. Under any circumstances, there are plenty of good CD options available, even in the current rate environment. The JP Morgan Chase product currently being syndicated by TD Ameritrade should be avoided. CDs, in particular many online five year CDs, are a safe option in the current interest rate environment. Editor's Note: This article cites a 6-month early termination fee on Synchrony Bank's 5 year CD product. In 2016, Synchrony Bank's terms and conditions were changes so that the early termination fee is now 1-year of interest on the CD. The last couple of weeks have seen virtually unprecedented volatility in the US bond markets. While some analysts (perhaps most notably Deutsche’s Joe LaVorgna) say that the Fed could surprise markets and raise rates as early as June 2015, we have also seen the 10 year Treasury fall below 2% as a result of Ebola and global market fears. As a result, the most sensible strategy for money that you do not anticipate needing for a period of time is to buy bank issued CDs, specifically 5 year CDs. By so doing, you are coming to terms with the likelihood that low rates may be here to stay for a reasonably long period of time and, thus, finding a safe way of getting higher yields than savings or money market accounts now offer and at the same time protecting yourself from the possibility of seeing the 10 year Treasury rise above 4% before October 2015. 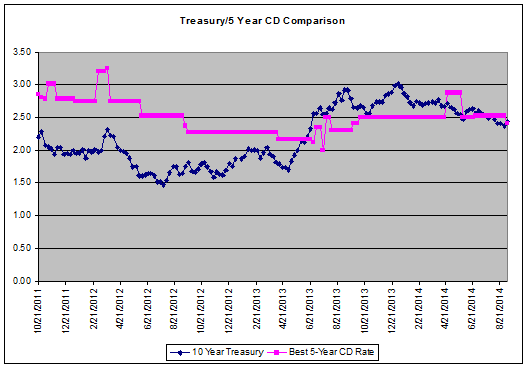 Bank issued CDs, especially 5 year CDs, offer higher yields than savings. Some banks also provide an option against a sharp move in Treasuries in the form of attractive early withdrawal penalties. Should interest rates move dramatically higher, bonds – even short duration bond funds – will move dramatically lower. We saw fixed income values fall in mid-2013 as the 10 year Treasury moved from 1.50% to 3.00%. The more relevant historical precedent remains the late 1970s when oil and food shocks boosted inflation and yields increased to double digit levels, leaving bond and bond fund holders with negative real income returns and punishing capital losses. Certificates of deposit do not bear the same risk. Should interest rates rise from their current levels and a long-term CD cease to produce competitive yields, investors usually have the option to withdraw the balance in part or in its entirely, forfeiting only an early withdrawal penalty calculated as a percentage of interest earned. The early withdrawal penalty will cut into some interest earned, but it can only reduce principle if one withdraws very early in the term. A six month penalty only is particularly attractive. Synchrony Bank is currently offering 5 year CDs at 2.30%. An investor placing, say, $200,000 in such a CD with one of these banks would receive more than $24,000 gross over the next 5 years, compared to about $10,202 were the same monies invested in a 1% savings account. In 5 years, a 5 year CD will outperform a savings account and will have generated a decent premium over the savings account, should savings rates stay where they are. However, if interest rates were to significantly rise in one year, the investor could exit the CD, paying only a $2,300 early withdrawal penalty (six months interest), and still have their entire principle plus $2,300 in interest. Under such a circumstance, the effective return of the 5 year CD in the first year would be 1.15% - still better than any currently offered savings or one year CD rate. Similar calculations show that yields on a five year CD can be still better than shorter term CDs in years two three and four, even when investors pay an early forfeiture penalty. In fact, the further away an increase occurs in interest rates in the United States, the better will be the positive impact on earnings from a 5 year CD with a six month withdrawal penalty. For example, the effective return of a 5 year CD held for 4 years may outperform that of a 4 year CD, even if the investor pays a six month early withdrawal penalty at the beginning of year 4. The option that you are getting inherent in a CDs early withdrawal penalty is valuable. While rates may rise quickly over the next year, these options offer depositors significant safety and security that bonds and bond funds do not. For these reasons, 5 year CDs are particularly compelling at this point. However, before making any purchases, you should always check to be entirely sure that you understand the early withdrawal penalty. See the best 5 year CD rates here. Until October 15, EverBank is offering a 3 year product that gives investors the opportunity to participate in the upside of a basket of 5 currencies (Russia, India, China, Brazil and South Africa) in what it calls a "Marketsafe CD". This product really is not a CD, but rather is an inappropriate investment for most. I have written in the past about EverBank’s practice of offering so-called “Marketsafe CDs” which are designed to give depositors the opportunity to earn above-CD rate returns tied to certain currencies or interest rate fluctuations. EverBank claims that the Marketsafe products, unlike those that it marketed a decade ago, do not involve a risk to principal if held to maturity and therefore these products can be marketed as CDs. The CD designation, however, remains dubious as EverBank reserves the right to return less (presumably much less) than the principal amount not only should you need the cash back earlier, but also upon death or adjudicated incompetence. Also dubious is EverBank’s right to offer these “Marketsafe CDs” with just an unclear termsheet instead of an offering memorandum filed with the SEC as is required by the Securities Act of 1933. The termsheet provides a little more color. It states that the product pays no regular interest for the three year period, but upon maturity delivers a single payment of your principal plus any appreciation of the basket of Russian, Indian, Chinese, Brazilian and South African currencies. While neither EverBank nor the depositor hold the basket, the exchange rates are observed bi-annually and the level of appreciation is calculated based on those measurements and a 20% allocation to each. There are underlying realities that anyone investing in this product would need to be keen to ignore. First, in spite of what EverBank says on its website, the so-called emergence of these economies does not necessarily translate to currency appreciation versus the US dollar. The Russian ruble, the Indian rupee, the South African rand and the Brazilian real have all depreciated against the US dollar over the last 3 years (only the Chinese renmenbi has appreciated). As someone who has done business in all five of these countries and observed the outflow of money gained from commodities there into real estate in North America and Europe, I can assure you that even if one or two of these currencies appreciates against the US dollar over the next three year, the entire basket will not. This is especially true given that the prospects for the US dollar to appreciate globally are so strong as US interest rates begin to increase over the next three years. Second, due to the measurement dates in EverBank’s instrument, the basket relies on steady and balanced appreciation versus the US dollar (decline in the US dollar) for the depositor to wind up with any appreciation in their so-called CD after three years. Each of these currencies is so inherently volatile that steady appreciation just is not going to happen in any one of the currencies, much less the basket. Third, your money is not worth nothing over three years. The best three year online CD rate is currently 1.50%. $200,000 invested in a CD at that rate over will produce $9,136 in interest (exclusive of tax consequences) over that time. Since EverBank’s Marketsafe BRICS CD relies on a steady appreciation of the five BRICS currencies versus the US dollar and does not benefit from compounding of interest, you will need to see not just a steady increase in the basket (decline in the US dollar) versus the basket, but a steady decline that amounts to close to 2% a year just to match the return on a CD. See the best 3 year CDs here. A product that has none of the features or appreciation of a CD, but instead has a very high likelihood of returning only your principal is not a CD, but an interest-free loan to bank, and a bad investment. Those seeking straight exposure to emerging markets can invest in a US dollar denominated emerging market bond fund (either sovereign or corporate), and those believing that a fall in the dollar versus emerging market currencies is imminent can invest one that is not US dollar denominated. Investors can also look at registered offerings issued from time to time by Morgan Stanley and other investment banks that are designed to return up to 11% annually if a single currency, such as the Brazilian real, appreciates against the US dollar, and still returns 1% annually if they depreciate. Historically, the wealthy and near wealthy have been prompted by brokerages like Morgan Stanley and Merrill Lynch to eschew CDs in favor of high grade municipal bonds. While the advice of the major brokerages has a self-serving function (they generate commissions on their clientsâ municipal bond trades, but lose assets under management when a client withdraws cash to purchase a CD), it has also been very sound advice. The competitive market in CDs and rapid decline in long term interest rates has now made intermediate term CDs much more attractive. As a general proposition, an investor who has carved out a sum of cash (say, $200,000) that they have relative certainty that they will not need for an extended length of time and do not want to risk, would give careful consideration to putting the money into a municipal bond. Buying a long-term municipal bond that is triple tax-free produces interest that can be especially valuable for those in higher income brackets. So long as the investor purchases only high grade municipal bonds insured by Berkshire Hathaway, the biggest risk to a municipal bond purchase is that interest rates rise and the value of the bond declines. Most municipal bond purchasers get comfortable with interest rate risk by accepting the notion that if rates rise, they will just hold the bonds to maturity. While purchasers today may get comfortable with the notion, they also need to recognize that municipal bonds ordinarily trade according to 10 year bonds rates. With those rates running around 2.40% and Bloomberg’s 10 year municipal bond index running at 2.20%, municipal purchasers in high tax states like New York, Massachusetts, Illinois or California are unlikely to find high quality 10 year munis yielding over 2% to maturity. This same investor now has the option of putting the money in a 5 year CD. While the CD does not have the same tax benefit (interest is taxable local and federally in the year of accrual), the rates are slightly higher (the best 5 year CD rate is now 2.30%) and capital invested in a CD is not at risk up to FDIC limits. Most importantly, the interest rate risk is simply much lower than that inherent in buying municipals with 10 year interest rates at such low levels. This chart demonstrates the spread between the 10 year Treasury rate and the best available 5 year CD rates over the last five years. With the rates crossing for first time in a year, and for the first time since higher rates became a real prospect in the US's immediate future, CDs look attractive. 1. A five year CD has a five year interest rate risk. If you apply the same notion that the works case scenario is that you hold to maturity if rates rise, a five year CD is always going to have a much shorter time horizon to getting your principal back than a 10 year municipal bond. 2. Most CDs allow breakage and a return of your principal with certain penalties. The penalties for breaking a 5 year CD among the major issuers of online CDs range from 6 months to 15 months of interest. If, for example, the US were to return to normalized interest rates in 2015 or 2016, you can pay the penalty and get your principal back. The municipal bond doesn’t have breakage provisions and you would be faced with a huge loss of principal if you were to need to sell. Tip: Always check the breakage penalty before you buy a CD. 3. Some online CDs allow for the penalty-free breakage of a CD upon the death of a holder at the request of the heirs, beneficiaries or executor (you may wish to ask before opening an account). If you were to die holding a municipal bond at your death, the executor or executrix of your estate may need to liquidate the bond and the value will depend on interest rates on that day and the liquidity of the bonds. Again, if interest rates were to return to their pre-2008 levels, your estate will recover significantly less than the price you paid for the municipal bonds. Even if you don’t plan to need your money, life throws curves. Municipal bonds bear interest rate risk. With municipal rates at very low levels, you may be better off handling the interest rate risk by buying a 5 year CD. See the best 5 year CD rate here.